Billy Clarke took advantage of poor defending to head in the winning goal. Billy Clarke scored the only goal following a long throw as Bradford edged out Swindon to make it six wins from seven games. He headed goalwards after the ball was allowed to bounce and keeper Tyrell Bedford's efforts to keep the ball out were ruled in vain by the linesman. Swindon's Jermaine Hylton stung the palms of Ben Williams from 20 yards. But Bradford rise to third, six points off the automatic promotion places, with five games left to play. Match ends, Bradford City 1, Swindon Town 0. 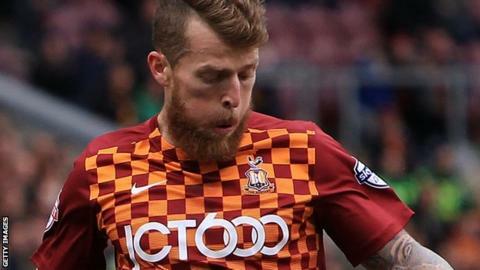 Second Half ends, Bradford City 1, Swindon Town 0. Corner, Bradford City. Conceded by Jordan Turnbull. Filipe Morais (Bradford City) wins a free kick in the attacking half. James Hanson (Bradford City) wins a free kick on the left wing. James Brophy (Swindon Town) wins a free kick on the right wing. Jordan Turnbull (Swindon Town) is shown the yellow card for a bad foul. Corner, Swindon Town. Conceded by Tony McMahon. Raphael Rossi Branco (Swindon Town) wins a free kick on the right wing. Attempt missed. Michael Doughty (Swindon Town) left footed shot from outside the box is just a bit too high. Attempt missed. Fabien Robert (Swindon Town) right footed shot from outside the box misses to the right. Attempt saved. Tony McMahon (Bradford City) right footed shot from outside the box is saved in the top right corner. Corner, Swindon Town. Conceded by Stephen Darby.